In a rush to find the perfect dip to bring to that last minute party but don’t know what to pull together? This keto mayo is the perfect side dish to any keto veggie or meat tray, and the best part is that it can be prepared in a total of five minutes. With the nutritional value and short prep time, this keto mayo is hard to beat. Unlike other types of mayo you typically see in your local grocery store, this keto mayo comes jam-packed with some key nutrients and healthy fats. Some of the top sellers in the mayo industry include some ingredients that have been shown to be extremely harmful in an individual’s health. Some of these damaging ingredients include canola oil, high fructose corn syrup, soybean oil, calcium disodium and potassium sorbate. The easy-to-throw-together ingredients for this satiating side dish include egg, olive oil, apple cider vinegar and himalayan sea salt. All of these healthy fats pull together 14 grams per tablespoon, with zero net carbs, making up a total of 124 calories. All of the ingredients in this keto mayo contain key nutrients — especially apple cider vinegar (ACV). There are not too many recipes out there calling for ACV these days, even though the health benefits of this liquid are through the roof. Some of the benefits of ACV include regulating blood sugar, improving cholesterol levels, improving skin health, reducing blood pressure and even relieving acid reflux. What other ways does ACV improve your health? People use it to improve the health of their gut, regulate blood sugar, enhance blood flow, improve their skin, balance their pH levels, whiten teeth, relieve cold symptoms, lower blood pressure, help detox their system and more. Whether you’re staying in for the night and want a little snack or maybe you need a last minute appetizer idea, this keto mayo not only goes with everything but it’s a quick fix packed with all the vitamins and minerals your body craves. Pick up these few ingredients the next time you’re at the store to whip up this simple dish. After allowing the egg to reach room temperature (leave out of refrigerator for 2 hours), carefully remove egg yolk from egg white. Dispose of egg white. In a small container that is just bigger than the blade of the immersion blender, add egg yolk, olive oil, apple cider vinegar, and salt. Place immersion blender into bottom of container while off. Turn immersion blender on and hold at bottom of container for 30 seconds. Mixture should quickly become consistency of mayonnaise. After 30 seconds of blending, turn immersion blender off. Bring immersion blender blade to top of mayonnaise mixture, turn on, and move the blender straight down. Do this three to four times, always turning the immersion blender off once the blade has reached the bottom of the container and turning back on only once the blade is back to the top of the mixture. Once emulsified, serve on your favorite savory keto dishes! Does this need to be refrigerated if I don’t use it all? How long can I keep a cup of this in the fridge? 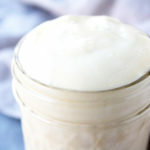 I need to know how long you can keep this home made keto mayo? Hi! I am also wondering how long you can leave this in the fridge for. Also any advice if you accidentally add too much vinegar? 🙂 Thanks! Hi Karly, this mayo should last for 5 days when refrigerated and stored in an airtight container.